The condition of the jaw bone is crucial in dental implantation . 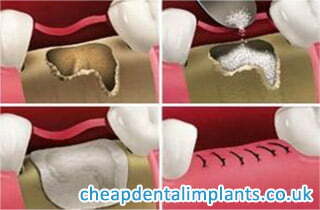 The implant may only be implanted into bones that have adequate height and width. These bones are able to accept, hold and carry the artificial root. 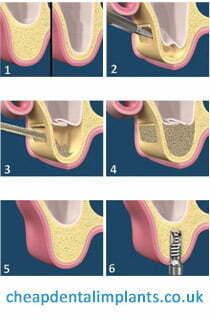 In certain cases, the jaw bones need treatment before the implantation. We are now going to discuss these cases, and list the different jaw bone augmentation procedures. This procedure allows for a lower extent of sinus lifting than the open method. In the latter case, the dental surgeon accesses the jaw bone by opening the gums . He then makes a window-shaped incision on the gum. I had a parcial denture, that has moved over time and has snapped a joining teeth. I am now left with 4 front teeth that have snapped off but the root is still in my gums. I am wanting a full top palette or implant replacement. Can you help or recommend what I should do. Unfortunately, without an x-ray not even an approximate quote can be put together, a description is insufficient. The necessary treatment procedures, exact positions and number of implants for the rehabilitation must be determined and your bone mass and structure must be evaluated for the planned implantation. We can only provide you with a detailed treatment and cost plan by means of an x-ray. After receiving the required panoramic x-ray, you will receive your detailed treatment plan with all the necessary information within 24 hours. Please let us know if you can send us a panoramic x-ray. If you need a referral to get one taken, we can of course send you one – we will need your DOB and address in this case.